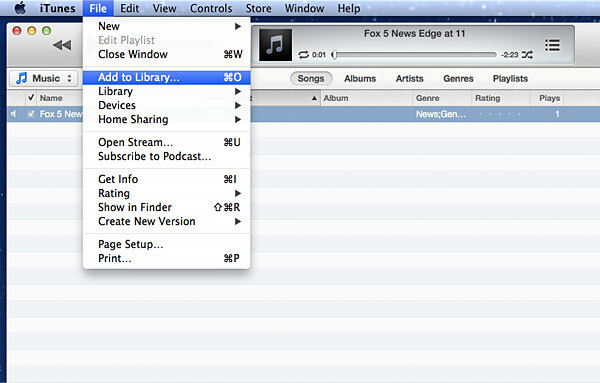 Home » ios » How to Import WMA to iTunes to Play WMA on iPod/iPhone/iPad? How to Import WMA to iTunes to Play WMA on iPod/iPhone/iPad? This article will introduce a detailed guide on how to import WMA to iTunes for Mac or import WMV to iTunes Match for iCloud. Then it is just easy to play WMA in iTunes (including the new iTunes 11), iPod, iPad, iPhone. Windows version of iTunes does have the ability to convert and import WMA files. However, iTunes for Mac can not convert and import WMA audio files. In order to successfully import WMA to iTunes for Mac, we can either use the Windows version of iTunes to convert or use a Mac WMA to iTunes converter to convert WMA to iTunes format. In fact, it is more feasible to use some Mac iTunes converter to finish converting WMA to iTunes compatible format. The following will introduce an ideal WMA to iTunes converter and a step by step guide on how to convert and import WMA to iTunes 11, iTunes 10.7 and etc. 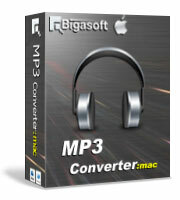 Bigasoft MP3 Converter is just the ideal WMA to iTunes converter! It can easily convert WMA audio file to iTunes supported MP3 format. Besides, it can convert other audio formats including CAF, WAV, OGG, AUD, FLAC, M4A, AAC, AC3, APE, AIFF and more to iTunes supported MP3 format. Moreover, it can also convert WMA to M4A, WAV, OGG, MP2, AU, AIFF, RA, AC3, etc. Step by step guide on how to convert and import WMA to iTunes or iTunes Match with the help of Bigasoft MP3 Converter. 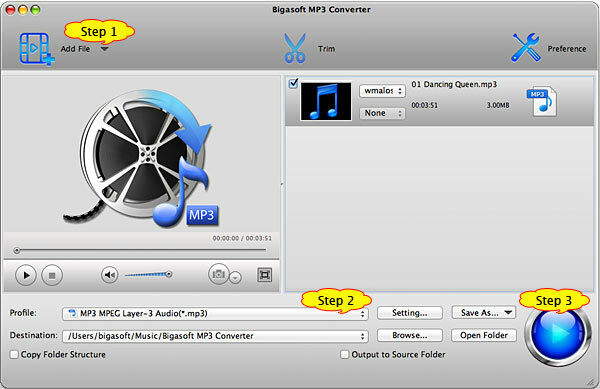 Free download Bigasoft MP3 Converter (Mac Version, Windows Version), install and fire up. Click "Add File" button to import WMA audio file. Or you can also drag your WMA file directly to the main interface of Bigasoft MP3 Converter. Click the drop-down button on the right side of "Profile" to select iTunes compatible MP3 format. Press "Convert" button to finish converting WMA to iTunes for Mac compatible audio format. Start iTunes for Mac, and then choose File > Add to Library... to import the converted WMA files to iTunes/iTunes Match, or you also can simply drag and drop this converted WMA audio to the iTunes Music Library. After finishing the conversion and importing, just play the converted WMA audio on your iTunes or sync them to iPod, iPad, iPhone, Apple TV to play WMA on iPod/iPhone/iPad on the go. Wait no more, just free download the powerful WMA to iTunes converter for playing WMA in iTunes/iPod/iPad/iPhone/Apple TV and more.